If you're familiar with HBO's Silicon Valley, you'll understand the reference for this project. If not, it'll seem very random. Either way, it's still very stupid. NotHotdog is an Azure Function that uses the Computer Vision API in Cognitive Services to determine if a provided image contains a hotdog or not. If you'd like to train your own model using the Custom Vision Service to recognize images for your domain, check out the NotBacon article. 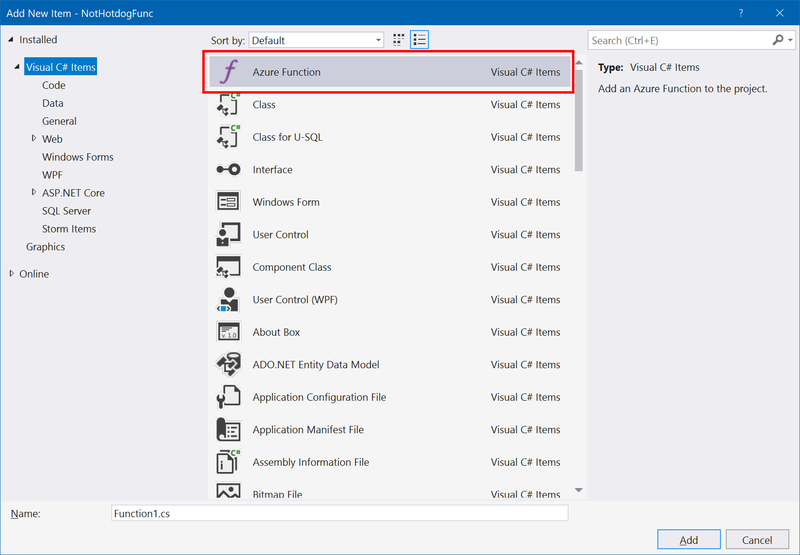 Give the Azure Function a URL to an image, or POST the image data to the endpoint, and it will return a JSON payload stating whether the picture contains a hotdog, along with the tags applied to the image by the Computer Vision API. To use the Computer Vision API, you will need an endpoint and key. Browse to the Cognitive Services API portal, logging in if necessary. Click the Get API Key button in the Computer Vision API section. You will be given an endpoint and 2 keys. Copy these to a safe place, but note that you can always review your information later at https://azure.microsoft.com/try/cognitive-services/my-apis/. If you have already used up your trial for the Computer Vision API, you can register for a production key using these instructions. Enter the information for your Azure subscription, such as the resource group, unique App Name, etc. This App Name will become part of the URL. You'll also need the Computer Vision API key and URL from the previous step. The function application will be deployed and the GitHub repo above will be setup as the deployment source. Additionally, the key and endpoint you entered will be automatically configured. 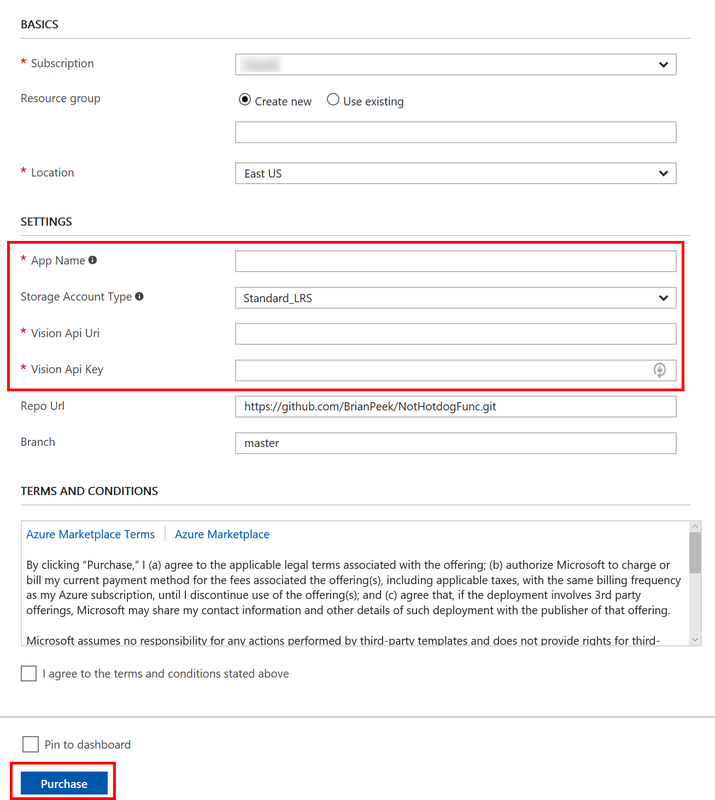 Copy down the URL to your function, which will be https://<appname>.azurewebsites.net , with the Function endpoint being https://<appname>.azurewebsites.net/api/NotHotdog . You can clone the repo and run the project locally. This requires Visual Studio 2017 version 15.3 or higher, with the Azure Development workload installed. For more information, see the docs. Note that if you opt to run locally, you will need to create a local.settings.json file in the same directory as the function with your endpoint and API keys. Here's an example -- simply fill in the VisionKey and VisionUri with the values given to you by the service, and leave the rest blank. The Azure Function is now configured and running, and will be available at https://<sitename>.azurewebsites.net/api/NotHotdog . To test it, let's use cURL to hit the endpoint, providing both a URL and POST data. Of course, you could call this from a web-based back-end, a mobile app, or anything else. Simply hit the endpoint in either way and parse the JSON response. You can see a sample web-based version running by clicking the "Try it now" button at the top of the article. 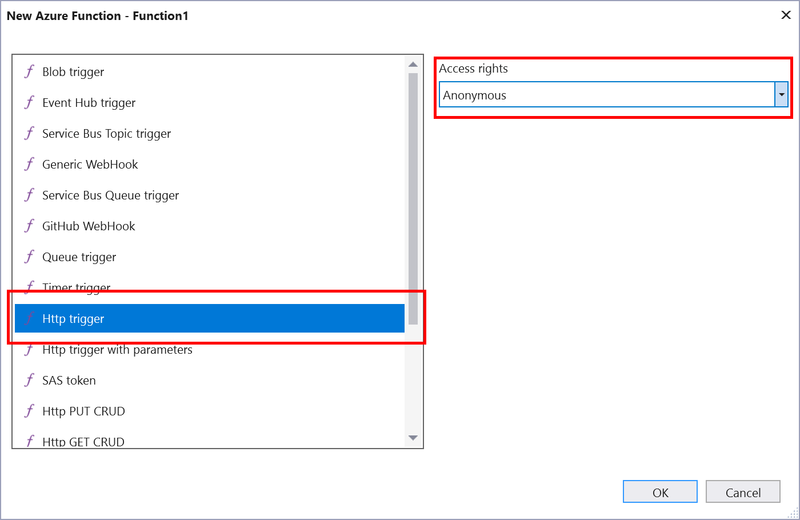 After the project is created, right-click on the project in Solution Explorer and select Add > New Item... from the context menu, then select Azure Function from the window that pops up, giving it a new name. Finally, select the trigger action, in this case Http trigger, and select its Access rights. Anonymous lets anyone access the function endpoint. For more details on these tools, please see the official docs. 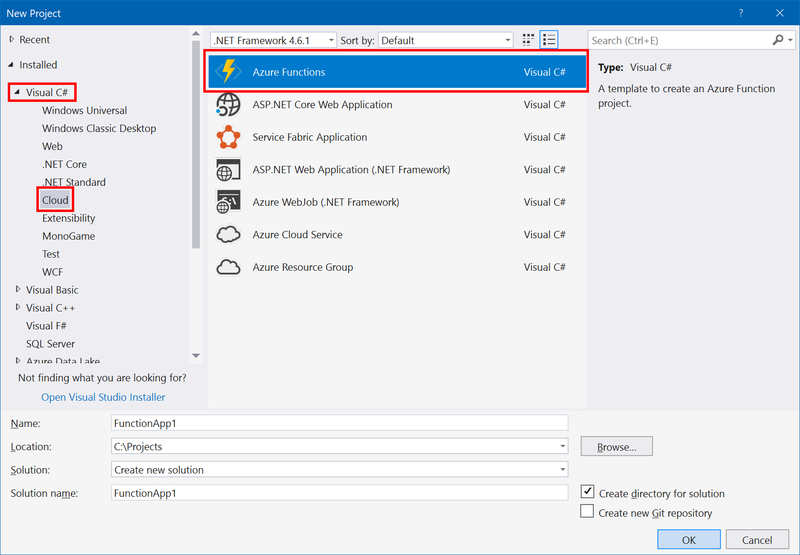 To use the Computer Vision API from C#, a NuGet reference was set to the Microsoft.ProjectOxford.Vision package, which contains the full API for .NET projects. The steps above have already done in the sample project, and a function named NotHotdog was created. The code for the function is only a few lines. Here's a very condensed version (see the source code for the full version). Here are links to the docs for the items discussed above. Play around with the project and feel free to leave comments on the article, open issues in the repo, or submit pull requests with fixes and new features. Check out NotBacon for a variant of this using the Custom Vision Service trained with images of bacon!